I love the energy of opening night. The anticipation of the audience and also from the performers is palpable. When I walked into The Storefront Theatre to experience the opening of The Chasse-Galerie presented by The Red One Theatre Collective, the energy and excitement was running high and I was excited for the lights to go down and the show to get on. The Chasse-Galerie is based on an old French-Canadian folk tale about four overworked coureur de bois wanting to visit their sweethearts in Montreal on New Year’s Eve. However, because of work they are 300 miles away and there is no “real world” way they can make the journey and be back for work in the morning. In walks the Devil, who offers them a deal too good to be true. 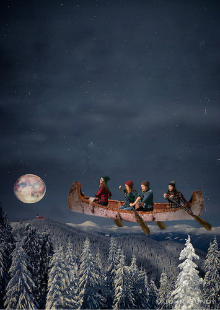 He will offer them passage on his flying canoe if they follow his guidelines and if not, their souls belong to him. The shows starts with a raucous musical number introducing our four heroines, and it really sets the tone for the rest of the night. Nathan Carroll’s Narrator gives us some background to the tale while the floor is packed with dancing and laughter. This is the third show I’ve seen at The Storefront and I was surprised to see the theatre-in-the-round setup when I walked in. The main setting for The Chasse-Galerie is The Flying Canoe tavern, and so when things got started I understood perfectly why they chose to present the show this way as opposed to the more traditional approach. By immersing the audience in the show, it allowed us to absorb the energy of the performance and really draws everyone in. Speaking of being drawn in, Tess Benger, Kat Letwin, Dana Puddicombe and Shaina Silver-Baird were all spectacular. Their talent shines whether it be singing, dancing, or simply through their timing in delivering a comic line. I was amazed to hear they only had one month of rehearsals, as you would think by their individual and collective performances they had been inhabiting these characters for a year. I could write a single review for each. Jonas Widdifield as Damien (The Devil) and Vanessa Salazar as his minion Lucy Ferr, are devilishly deviant. One highlight was the opportunity to sing along with Damien as he lists off his favourite French curse words and details why he loves his demonic ways. With The Chasse-Galerie being a musical, its Musical Director wins a gold medal for his work. James Smith did an excellent job composing both heartfelt and hilarious songs that were as much a part of the performance as the performers. Considering all this, The Chasse-Galerie is a mastery of moving parts and Stage Manager Lin-Mei Lay deserves high praise for keeping every one of those parts running smooth. Another aspect of opening night I love is the opportunity to see the faces behind the names of those involved in the production. When all the fun and dance was over, director Tyrone Savage took the stage and pointed out those “behind the curtain” who worked on the production. Savage also mentioned that the intention is to make The Chasse-Galerie an annual holiday tradition. I do hope this becomes reality as this show is exactly what the holidays should be about: fun, song, dance, and laughter, with a couple tears mixed in, and maybe the odd tipple of whisky.